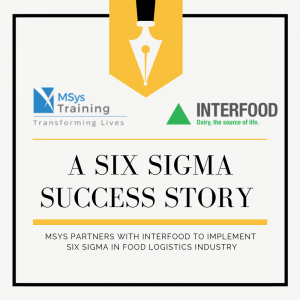 Interfood Inc. Partners With MSys Training LLC To Build Solutions Using Lean Six Sigma Methodologies. There were 603 press releases posted in the last 24 hours and 153,893 in the last 365 days. MSys Training,one of the leading certification training providers collaborated with Interfood Group, a leading global dairy supplier to implement six sigma. Six Sigma methodology is a combination of statistical theory, quality control and business tool that would help Interfood to enhance their business procedures on removing defects, improving profits and enhancing performance while reducing inconsistencies in processes. Paul Ryan, who has his Green Belt in Six Sigma from the American Society for Quality (ASQ), and his Lean Six Sigma Black Belt, facilitated the training on behalf of MSys said “the participants in the training workshop participated enthusiastically and were keen to know about how Six Sigma will make a significant change within their workplace”. According to Shantanu, Director L&D from MSys Training “With a joint focus to implement lean six sigma methodology in food industry, we were able to analyze various root causes of the difficulties and further narrowed down to strong strategies towards quality improvement initiatives of Interfood. It is a great collaboration and the training will definitely help Interfood enhance its performance and productivity”.